Sing, Meadowlark intersects fantasy and politics with tender lesbian love stories. Set in the future, this play recounts the stories of both a young lesbian professional and an older lesbian prime minister of the Isle of Cali, and the challenges of returning to an America that is officially openly hostile to lesbian and gay people. The Great Earthquake destroyed California and created a new island called Cali, 25 miles off shore. In 2020, the Q-1 gene that causes homosexuality was discovered. The repressive U.S. government decreed that all U.S. citizens must be tested for the gene. Those who test positive are banished to the Isle of Cali, never to return to America. In 2055, the beautiful 32 year old Minister of Cali’s Department of Aging is sent to New York to share Cali’s very successful elders program at the World Conference on Aging. There she meets the daughter of the U.S. president and confusion ensues. Simultaneously, she and her gay male body guard search for the former lover of Cali’s Prime Minister. 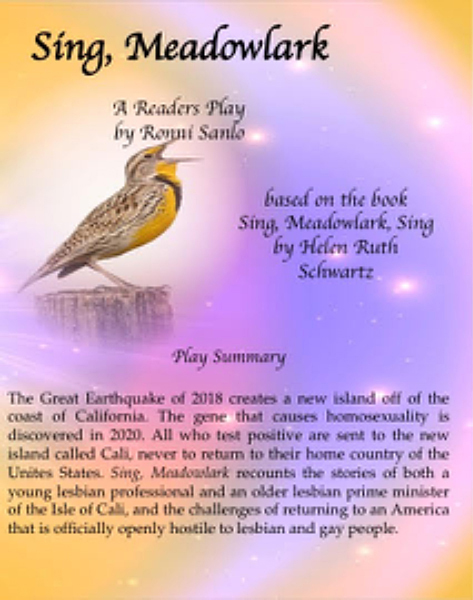 Sing Meadowlark postulates a future in the U.S. that legally discriminates against people who are lesbian or gay as proven by the mandatory testing for the Q-1 gene. Though a comedy by nature, the play is also a serious look at what the future might hold if repressive administrations remain in power. The Long Island home of the President of the U.S.
To order a PDF review copy, please contact Ronni at Strait Knot Productions. A power point program of the settings are included with the purchased of the production script.